Do you travel often and find yourself clueless as to the different attractions to help make your experience magical? This happens to many tourist and or new residents of a city. mX Great Britain, by Mobiexplore, is the perfect solution to your travel challenges. 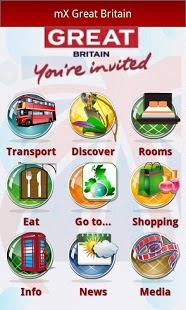 With this app, you will be able to explore Great Britain in the most intimate fashion. You don’t have to worry about missing the musical you’ve been waiting to see or viewing the city from a famous roof top. This app is equipped with more than 1,500 attractions for your to visit. Don’t worry if you are missing a connection, there are several offline maps to conveniently help you navigate the city without a signal. However, a unique feature, this app will also help you locate wifi hotspot locations. This app can safely be considered an official and highly reliable guide to help you get around Great Britain. You will find the many places to shop and the endless things to do. You will never get bored with this app in your hand. You will also be able to enjoy the convenience of booking travel needs as they come about. For example, you can secure a hotel, make dinner reservations at your favorite restaurant, book a flight, buy tickets for a tour of the city, and the hottest musical on the market. Yes, you can do all this within this single app. This app boasts a 4 star rating. You are required to have an Android device with a 2.1 version update or better to enjoy the many features of this app. This app is on version 2.7 and you can feel comfortable knowing the previous bugs have been fixed along with additions such as a larger database, more offline content, and improved offline mapping. To top it all off, this amazing app is absolutely free.